There’s a saying that the only things you can count on in life are death and taxes. But for recreational marijuana business owners in Colorado, the second part of that statement wasn’t true for a single day last month when the state waived its 10% tax on adult-use sales and 15% excise tax on wholesale transactions. So what did this rare tax holiday – which stemmed from an obscure provision in the state’s constitution – mean for Colorado’s recreational cannabis industry? 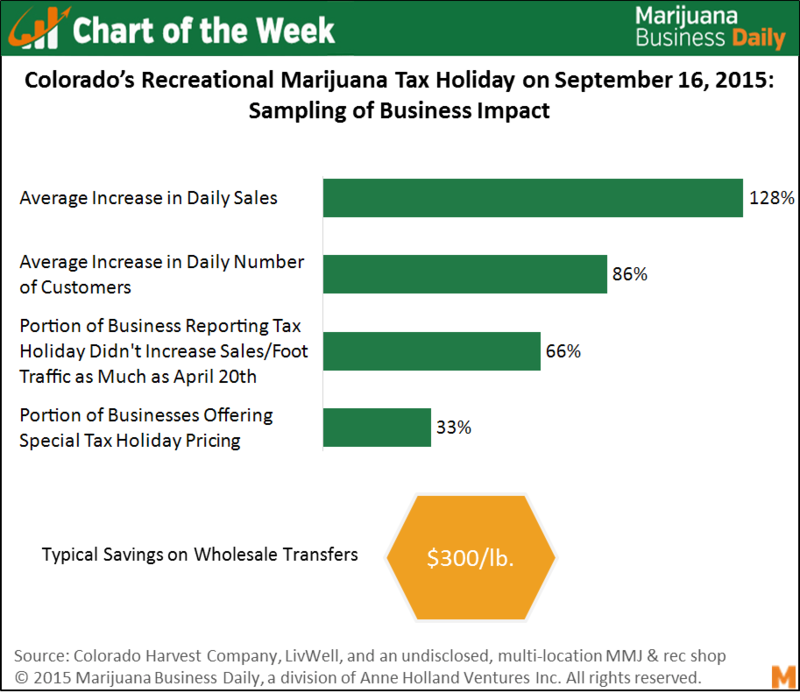 Marijuana Business Daily obtained some financial and operational data tied to the tax-free day from three multi-location recreational shops in the state: Colorado Harvest Company, LivWell and a third business that asked to remain anonymous. While each company took a different approach to the day, they all were able to boost sales and get more customers in the door as well as pocket serious savings on wholesale transfers. Two of the three sampled businesses chose not to offer any special pricing, but instead executed advertising campaigns to boost customer awareness of the day and drive traffic to their stores. The third retail chain, Colorado Harvest Company, took a more aggressive approach and not only offered special pricing on top of the tax savings, but also held the grand opening of a new location on the day. All three businesses experienced significant upticks in sales and foot traffic, with average increases of 128% and 86%, respectively, over a typical day. One business saw a sales increase of 2.7 times its normal mid-week daily revenue. Each business also reported serving about two to three times the typical number of customers. Despite those impressive spikes, all three retailers said the increase amounted to a blip in an otherwise normal or average month. This was largely due to savvy consumers either delaying or accelerating purchases they would otherwise have made in order to take advantage of the tax savings. Additionally, the sales spike didn’t match the increases on and around the 4/20 cannabis holiday, which draws people from all over the world. The real benefits materialized for retail stores that purchase cannabis from wholesalers, as they were able to stock their inventory without paying the 15% excise tax. “It worked out to be a typical sales month as the next couple days were slow. However, the ability to transfer product without the excise tax…was something we’ll enjoy for a couple of months,” said Tim Cullen, CEO of Colorado Harvest Company. Though this was a one-time circumstance due to a quirk in Colorado’s constitution, the outcome highlights the importance of cannabis businesses being close to the pulse of their markets and always on the lookout for opportunities to build brand recognition, drive sales and save money.